Experts Suspect Nerve Agent Was Used In Syrian Attack : The Two-Way An attack on a rebel-held region of Syria on Tuesday has killed dozens of people. Video and eyewitness reports suggest powerful chemical weapons are responsible. 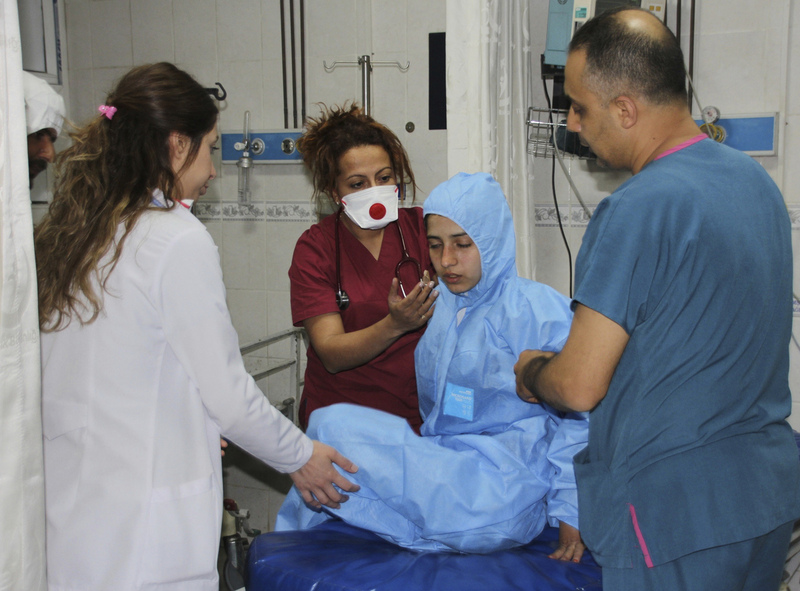 Medics at a local hospital in Hatay, Turkey, treat a victim of an attack across the border in Idlib, Syria, that experts suspect may have involved a powerful chemical weapon. In a separate statement, Doctors Without Borders said one of its teams had examined eight survivors of the attack who had exhibited symptoms of exposure to "a neurotoxic agent such as sarin" — including constricted pupils and muscle spasms. Those symptoms are consistent with "any one of the chemicals in that chemical family of nerve agents," agrees Dan Kaszeta, a chemical weapons expert with Strongpoint Security, a London-based consultancy. Kaszeta says it's the strongest evidence of an attack using nerve agent since an August 2013 strike on a Damascus suburb that killed hundreds of people. After that incident, President Bashar Assad's regime was pressured into surrendering more than 1,000 tons of chemicals to international observers. Syria also joined the Chemical Weapons Convention, a treaty prohibiting the use of such weapons. The surrender of the weapons material was considered one of the few diplomatic wins for the Obama administration, which struggled to respond to the Syria crisis. Since then, combatants in Syria, including government forces, have been accused of regularly violating the convention. But Kaszeta says most chemical attacks in the region have involved chlorine gas, which is much less lethal. "Chlorine is primarily is an irritant to the respiratory tract," Kaszeta says. Although formally considered a chemical weapon, it only kills in extremely high concentrations. "It's sort of a glorified tear-gas." By contrast, nerve agents such as sarin work by disrupting the nervous system's communications with muscles throughout the body. Exposure to tiny quantities causes spasms and pinprick pupils — of the sort seen in videos from Tuesday's attack, Kaszeta says. The Russian government has claimed the chemicals were released after Syrian government forces hit a rebel chemical depot. Kaszeta says that's doubtful because nerve agents are unstable and are typically stored as two separate chemicals. With sarin, for example, one of those precursor chemicals is highly flammable isopropyl alcohol. "You drop a bomb on it, the whole thing is going up in a huge fireball," he says. Even if the nerve agent was pre-mixed, a bomb strike would fail to disperse it in a way that could cause mass casualties. Kaszeta says he thinks the most likely source of chemical was the Syrian regime. Sarin and other nerve agents are hard to make, and it's unlikely that rebel groups would have access to it. Assad was known to hold large quantities of "precursor chemicals" used to make sarin, and although the government surrendered much of that material, it's possible that some was left undeclared to international inspectors. In addition, Kaszeta says, the Syrian regime is still believed to have experts who could make nerve agent from scratch. "It's not like we arrested their scientists and chemical engineers and technicians," he says. "Nothing happened to those guys." The Organization for the Prohibition of Chemical Weapons says it is "seriously concerned about the alleged chemical weapons attack" and is gathering and analyzing information "from all available sources." If it is true that Syria is once again using nerve agents, Kaszeta says it would be a huge strike against the international system of treaties and inspections designed to prevent the use of chemical weapons. Three years ago, "[Assad] used some, maybe all, of his chemical weapons as a poker chip, and gave that up for another chip that said, 'Don't bomb me," Kaszeta says. But the use of chemical weapons has continued, and the regime may now be emboldened. "I hate to be pessimistic about this whole thing, but he's gotten away with it so far, why wouldn't he get away with it again?"